Mercedes-Benz teased us at the Geneva auto show last year with a GT-inspired AMG concept that looked drop dead gorgeous. We pined for this car to become a reality and Mercedes-Benz answered our prayers. It will show off the production model at this year's Geneva auto show, but the first image of the car was captured ahead of time, revealing a fierce-looking sports sedan. The four-door AMG incorporates the styling of Mercedes-Benz's GT coupe. For better or worse, Mercedes has kept the styling of its sedans slightly scaled back, never reaching the sporty looks of the GT coupe. But as it tries to appeal to more consumers, it decided to combine both styles into on fantastic car. Without a doubt, the new AMG looks great. The front fascia looks much more aggressive akin to other sports sedans from Aston Martin. The lone image captured is that of a mismatched red body with a black bumper. This was likely to try to hide the car's look, but it didn't do a very good job because it leaves little to the imagination. 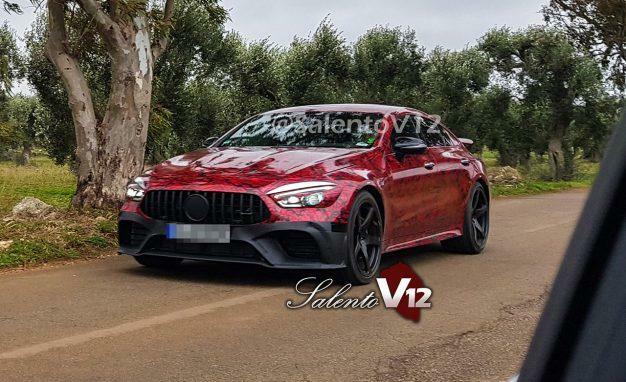 Early reports peg the new four-door AMG to come with a twin-turbocharged 4.0-liter V8 engine just like its GT coup brethren. It's rumored to possibly incorporate a gas-electric powertrain, but specifications haven't been revealed. We won't know the final specs of the new four-door AMG until Mercedes-Benz unveils it at the Geneva auto show in next month.